I am definitely a fan of your haikus! 😀 Awesome! and all that ache in numbered syllables… sigh ! 🙂 🙂 loved it ..
PS – you understand my sighs .. don’t you ? 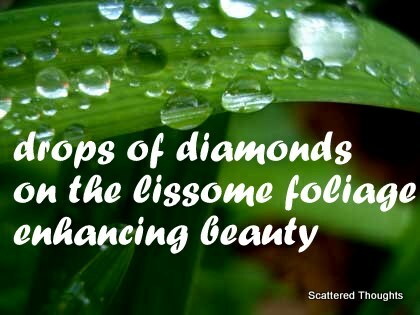 The sight of early morning dew drops on green leaves – This is what comes to my mind when I think of beauty. And when that sight is combined with such haiku, I don’t think anything could be more beautiful ! and those drops are magic!!! :)lovely capture! Wonderful Maniparna – simplicity that sparkles! Lovely post, Maniparna! Refreshing and inspiring! Indeed enchanting beauty. Beautiful words, as always. After the storm…beauty…or even during the storm. Went particularly well with the picture, and nicely presented. It had the lovely, humourous, literal ‘other side,’ – I can imagine some people murmuring that in the ear of their partner, at the appropriate occasion! That made me smile but I liked this one all the more for it. Loved the pic 🙂 The drops look amazingly refreshing. So refreshing to see the shining drops of dew on the brilliant green foliage…nice one.